L 22″ (56 cm) W 40″ (102 cm). Description: Sexes similar. Very long central tail feathers. 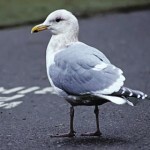 Breeding adults show distinctive contrast between gray mantle and darker flight feathers. Lack white patch on underwings. Gray above; white below; black cap; and yellow wash on throat. Dark phase juveniles are brown with black barring overall; and light phase juveniles have dark head, white belly, and strong barring on tail coverts. 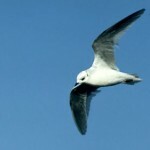 Habitat: Breeds in upland tundra, and spends rest of year on open ocean. Where in Nebraska: Accidental. Specimen collected in Lancaster County in 1952. 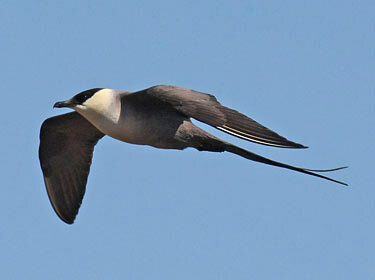 Fun Facts: Long-tailed Jaegers will pursue gulls and terns, forcing them to regurgitate their food, and then capture the food from the air before it hits the water. 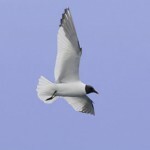 However, it is the least likely of the jaegers to harass other seabirds for their food.